As my sis, Wen is back from South Africa, she brought the whole troop with her, her hubby and her parents-in-law. So during the day in my mum's place, there are 10 adults + 2 kids. It's kinda packed and squashy with too many people in a little apartment. It reached the point where you gotta queue for your turn to pee. Hehe. But on the other hand, we love having them here. It gives us a chance to bond as a family. And we got to be all touristy again showing them our beautiful Penang. It amazes me sometimes how two families from different parts of the Earth come together and become this extended family, and how much we clicked! 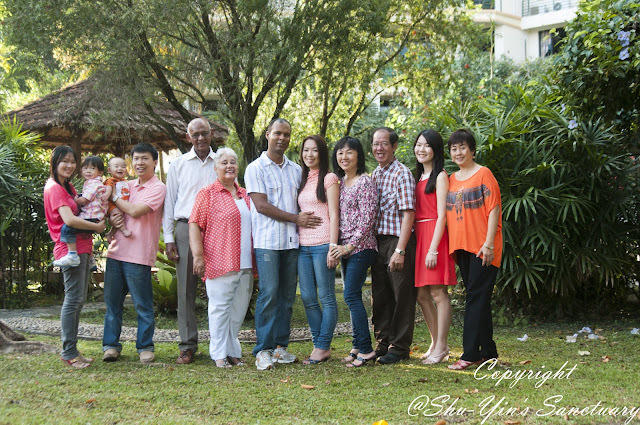 So this is a photo of our beautiful extended family, in our apartment garden.